Many cities now host “beer weeks”—Denver, Seattle, Portland, Boston, San Diego and San Francisco to name a few, now Fairbanks, Alaska is in the mix! We’re excited to announce our involvement in Alaska Beer Week, 10 days designated to celebrate delicious craft beer. Get ready! 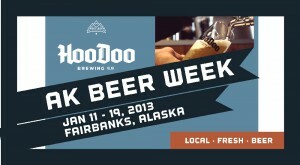 Alaska Beer Week runs Friday January 11 through Sunday January 20, 2013. This year will feature taproom events like Cupcakes and beer pairing with local A&K Cupcakes, Sausage, Mustard and beer pairing with Homegrown Market and Moosetard, tappings of HooDoo’s new Barleywine and American IPA, and an analog night where only vinyl records will be spun. Tuesday, Jan 15 – Saturday, Jan 19: $4 Pints. Every pint purchased = one raffle ticket for daily drawing and big drawing on Saturday the 19th. Saturday, Jan 19: 1-3pm, Sausage, mustard and HooDoo pairing featuring goodies from Homegrown Market & our neighbors Moosetard.